For those of you who might not know this, I’m Malaysian and proud to be one. As a Malaysian, we are known for the diversity of our food. Food is part of us. We LOVE to eat, no matter what time it is in the day. We are spoilt with choices and to make matters worse, we have lots of restaurants, which are open 24/7. We are a nation that eats out most of the time. As a result, we are currently the FATTEST country in South East Asia. Almost half (47.7 percent) of the Malaysian population aged 18 and above are overweight or obese. And you know what, I’m scared. I’m worried for the future of my people, my kids and the kind of environment they’ll be brought into. And I believe that one of the major causes to this obesity epidemic comes down to our food - what we put into our body on a daily basis. Let’s face it, most of us aren’t aware of how bad a food can be for us because we are used to eating this way. We watch our parents eat this way as a result; we feed our kids with the unhealthy stuff. Or perhaps we don’t even care until something happens to us – high blood pressure, high cholesterol, diabetes, stroke, heart attack and more. I’m not going to tell you to change your diet rapidly or even ask you to STOP eating out. Instead, let’s look at how we can make healthier food choices and still enjoy our local dishes when eating out. 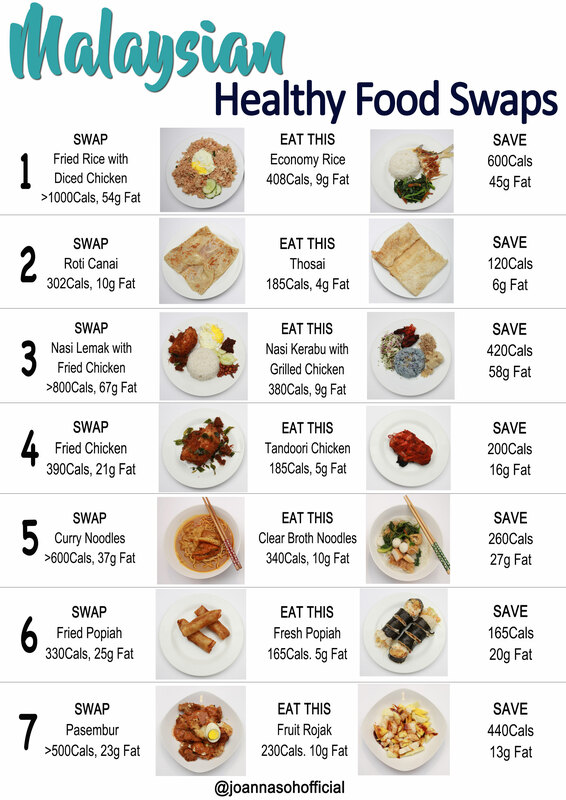 Here’s my take on Malaysian Healthy Food Swaps. Do you know that when you order a plate of fried rice, you’re not just getting one cup but 3 full cups of rice! That amount has over 1000 calories and over 50g of fat. That’s half of your daily calorie recommendation in just one meal. Swap it for Economy Rice instead. 1 cup of rice served with steamed fish and stir fried vegetables has about 400 calories. This plate has a balanced of carbs, protein and healthy fat to keep you satisfied, NOT sluggish! You’ll be saving over 600cals and 45g of fat! Mamak lovers. One plain roti canai has about 300 calories, it’s basically made from flour and ghee. Now, that’s before dipping it into curries. Consuming this on a daily basis can lead to high cholesterol and eventually heart attack. Swap that for Tosai or Chapatti instead. One piece of thosai has under 200 calories and it’s a more nutritious option as it is made from rice, split black lentils and fenugreek seeds. We LOVE our Nasi Lemak a.k.a. coconut rice. We have it for breakfast, lunch and even supper. Coconut rice on it’s own is not a bad choice, but what we choose to serve on the side, can be a killer – fried chicken, fried egg and sambal. Basically NO vegetables at all! That one plate has over 800 calories and 67g of fat. No wonder we’re gaining weight. Swap that for Nasi Kerabu instead, which is served with lots of fresh green vegetables, herbs and toasted coconut. This one plate served with grilled chicken only has about 380 calories. It’s high in fiber, protein and carbs. You’ll be saving over 400 calories, 58g of fat and your waistline! A piece of fried chicken is like a sponge. It absorbs all of the oil into the meat. This one piece has about 390 Cals and 21g saturated fat soaked into it. Swap it for tandoori chicken instead. You’ll be saving 200Calories, 16g Fat and you’ll be consuming only the good lean protein for your muscles. Typically a Malaysian curry noodle is prepared with lots of coconut milk and oil to make it flavoursome, hence it’s extremtly high in calories and fat. One bowl has over 600Calories and 37g of fat. It’s not the best option to consume regularly. Swap it for clear broth noodles instead, which is way lower in calories and fat (340Cals 10g Fat). If you can, request for less noodles and add more vegetables. Do you know that this one tiny piece of fried spring roll has over 100calories? Let’s face it, you won’t be consuming just one piece, probably 3 pieces. Now that’s 330Cals and 25g of fat, just for your afternoon snack. Swap that with my favourite Seaweed spring roll instead. This large roll only has about 165 calories. It’s crunchy, it’s packed with fresh vegetables and it will keep you satisfied. I love to have this for breakfast! Passembur is basically Malaysian salad consisting of fried fritters. Instead of packing the plate with fresh fruits and vegetables, we tend to top it up with all the fried stuff. This one plate has over 500 Calories and 23g of fat, mainly coming from the fried fritters. Swap it for fruit salad instead, which has about 230cals and you’re getting all the good nutrients for your body. It is definitely a healthier snack choice to eat. Briyani rice is cooked with oil or ghee. This one cup has more than 300 Calories and 18g of fat. Keep it simple and swap it for plain white rice instead, which has about 205calories per cup and only 0.4g of fat. This simple swap will reduce your fat intake drastically. Swap it of steamed fish or chicken and lightly stir fried vegetables. You’re filling your body with clean protein, fiber and carbs. You’ll be saving more than 200 calories and 30g of fat! And remember to watch your food portion, no adding extra rice! One tiny piece of deep fried banana fritter has about 120 calories. Again, let’s face it, we won’t be having just one. It’ll be at least 3 servings, and that’s about 360cals. We basically just turned a healthy snack into unhealthy by deep frying it. So swap and just enjoy banana on its own. 1 piece of pure nutritious banana only has 105 calories and it’ll provide you with sustained energy and boost your workout performance. Those innocent looking Karipuff are loaded with calories and fat! One tiny portion has about 120Calories! Again, you’ll probably have 3, which means 360calories and 18g of fat! Swap it for steamed sweet potato, which has 150cals and only 1g of fat per serving! It’s sweet, it’s nutritious and it’s delicious. Our Malaysian favoutie Teh Tarik is made with lots of condensed milk. It’s extremely sweet and high in fat. Just one cup has 180 calories, 6g of fat and 20g of sugar! That amount of sugar is almost the daily recommendation in just one cup. Swap it for Teh O instead, which is only served with sugar. And ask for less sweet! One cup has 64 calories, 5g of sugar! This is the same with our favourite local coffee. Again swap it for black coffee and reduce on the sugar intake. cooked grill or steam over deep frying and battered dishes. Avoid adding more rice, add more vegetables instead. And if you can, choose to cook more often than eating out. 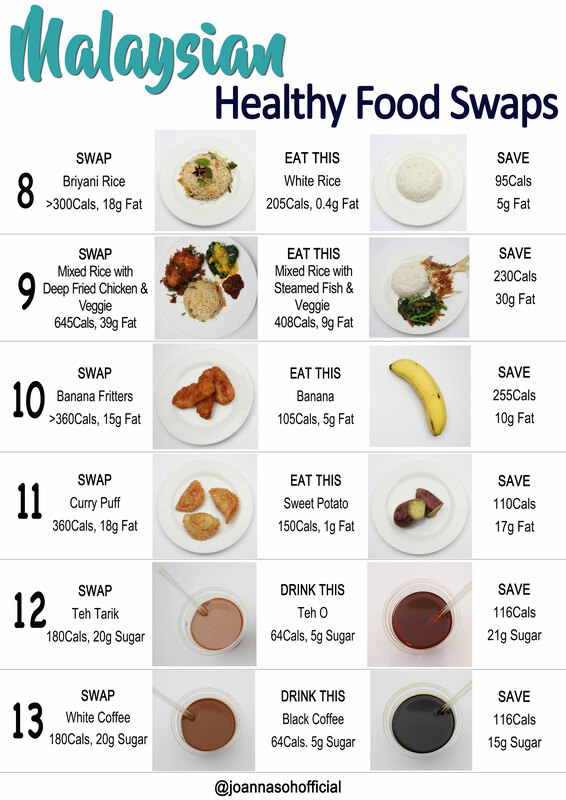 All these food swaps may seem difficult to begin with. 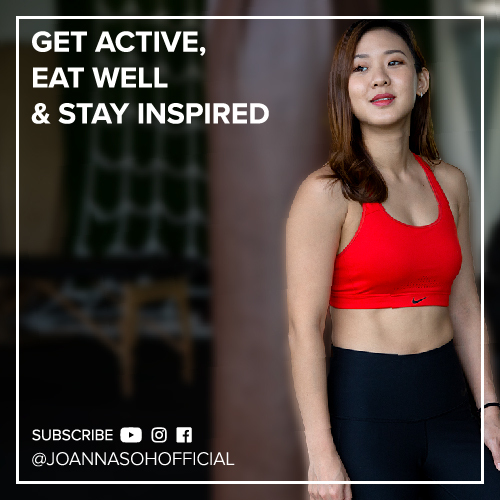 But as we become more conscious of our eating habits and practice making better choices, you’ll start to notice the different on your body, your energy level and you will be saving yourself from all the diseases. How you eat will affect your family and friends. Just ask yourself, are you happy with your weight right now? Do you feel good in your body? Do you feel good after a meal? Or Do you want to see the future generation growing up in an environment where obesity becomes the norm? We are what we eat. We CAN make a difference today and that starts with each and every one of us. How are you making better food choices today? Let me know in the comments below.